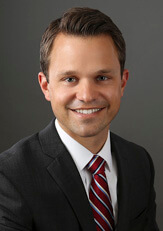 Jesse J. Klick | Fafinski Mark & Johnson, P.A. Jesse Klick practices in the General Corporate & Business group at FMJ, where he represents companies and investors in entity selection and formation, business transactions, mergers and acquisitions, and general corporate matters. Additionally, Jesse represents lenders and borrowers in connection with commercial lending and financing transactions, including asset-based lending and commercial real estate, as well as advising clients on commercial leasing matters. With both law firm and corporate experience, Jesse leverages his diverse legal and business knowledge to provide clients with legal solutions that also fit their business needs. Jesse began his legal career working for a Twin Cities-based international law firm focusing on complex commercial financing transactions. Most recently, he was the sole legal counsel at a closely-held software company. Jesse lives in Minnetonka with his wife Jessica and loves the short commute time to the office. He enjoys spending time outdoors, particularly running, and boating on Lake Minnewaska in the summer. As the fall leaves begin to change, Jesse also enjoys pheasant hunting in Minnesota.